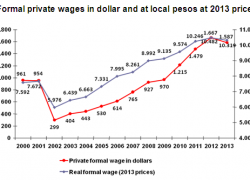 The acceleration in the rise of the dollar and its consequent pressure on the interest rate forced the economic authorities to improvise actions to try to calm the run against the peso. Thus, a change was announced in the primary fiscal deficit target, from 3.2% to 2.7% of GDP, without specifying how this will be achieved. Market expectations did not respond in line with what was expected, so the government decided to request financial support from the International Monetary Fund (IMF). National officials argue that the volatility in the exchange market is exaggerated since the goal of reducing the fiscal deficit is being exceeded. Under this logic, going to the IMF is a pragmatic option that will help to dispel doubts and discourage speculative movements, in addition to obtaining financing at a lower cost. 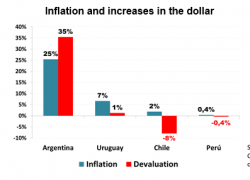 An alternative hypothesis is that the pressure on the dollar is originated fundamentally in the inconsistencies of the adopted strategy and that the IMF, in addition to providing cheap financing, should induce the authorities to correct errors. The primary fiscal deficit (that is, before the payment of interest on debt) it went down from 4,3% to 3,6% of the GDP. 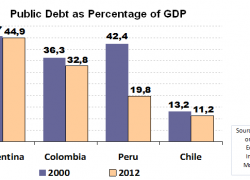 Interest payments on public debt rose from 1,6% to 2,3% of GDP. This implies that the total fiscal deficit remained at around 5,9% of the GDP. These data show that the total fiscal deficit, which is the most relevant variable to measure the sustainability of public finances, is not decreasing. 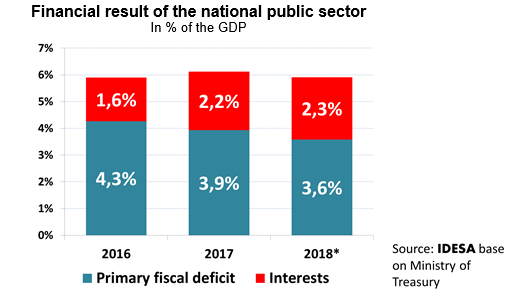 It is true that the primary deficit fell 0.7% of GDP, but interest increased by an equivalent magnitude. That is, the decrease in operating expending hardly compensates for the increase in interest payments generated by the growing indebtedness. The inconsistency is possibly generated by an excess of confidence in the friendliness of the markets. But it is human that the decisions of those who manage investments are based on the reality of a persistent total deficit. Faced with this situation, the pressure on the dollar, the interest rate and prices is inevitable and, with this, the impossibility of fulfilling the objective of reducing inflation. To reverse this process, the Ministry of Treasury should induce the rest of the cabinet to reduce expenses with greater speed, so that the Ministry of Finance contracts less debt and the Central Bank issues less money. In this sense, it would be a very costly mistake that the agreement with the IMF limits itself to validating the current dynamics and only serve to prolong the inconsistency with cheaper financing. If it does, it will confirm the suspicions that it is an organism that induces over-indebtedness to the countries that it says help. The main support that Argentina needs is not money but ideas to give consistency to its strategy. It is not about abandoning gradualism, but about giving it more speed to avoid the social costs of the fiscal deficit. Reducing the deficit faster and being less dependent on indebtedness is the best way to care for the most vulnerable sectors. For this, it is essential to order federalism appealing to the spirit of the Fiscal Consensus when it establishes that the Nation must stop financing the public services of the City and Province of Buenos Aires and stop meddling in provincial and municipal functions (that is, review federal programs in education, health, environment, social development, housing and urban planning that correspond to the provinces). More importantly, it is to address the pension reform to review the special regimes that retire people before or with higher pensions and the double coverage that occurs between retirement and spousal pension.